BUYSOUNDTRAX Records presents the original soundtrack to ONE MAN JURY. The soundtrack features music composed by Morton Stevens for the 1978 action thriller written and directed by Charles Martin and starring Academy Award-Winner Jack Palance (SHANE, DRACULA, CITY SLICKERS), Christopher Mitchum, Pamela Shoop, Joe Spinell, Angel Tompkins, Jeff McCracken, Tony Sirico, Richard Foronjy and Frank Pesce. Set in Los Angeles, ONE MAN JURY takes a page from DIRTY HARRY and finds Jack Palance playing Jim Wade, a police inspector with a history of bending the rules of the law to get what he needs to close a case. He’s hot on the trail of a serial killer with a taste for necrophilia while at the same time, trying to gather up evidence to put mobster Mike Abatino behind bars. When Wade finally catches up to the serial killer, he comes to the conclusion that our modern court system is not yet capable of dealing with a criminal like this and he executes him with a bullet to the head. Now having liberated his mind from simple concepts such as the Miranda Act and a man’s right to a fair trial, Wade sets his sights on the other case that keeps him from sleeping at night, mobster Mike Abatino. Born In Newark, New Jersey in 1929, Morton Stevens studied composition at the Juilliard School and became the arranger and later, the musical director, for Sammy Davis, Jr., Frank Sinatra, Dean Martin and Liza Minnelli. He also served as music director for CBS and was a prolific composer and arranger for television for over 30 years. Best known for the famous theme music for HAWAII FIVE-0, for which he won two Emmys, Stevens contributed music to many television shows, including GUNSMOKE, POLICE WOMAN, THRILLER, WAGON TRAIN, THE MAN FROM U.N.C.L.E., CIMARRON STRIP, THE WILD WILD WEST, TINY TOON ADVENTURES. Stevens also served on the board of directors for the Academy Of Television Arts And Sciences. Surprisingly, he only scored a few feature films including ACT OF PIRACY, THEY STILL CALL ME BRUCE, CRACKING UP and THE RAIDERS. Surprisingly, a great deal of the composer’s output has not been released on record or compact disc. 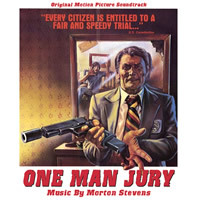 BUYSOUNDTRAX Records presents the premiere soundtrack release of Morton Stevens' score for ONE MAN JURY, including the the complete musical score performed by the National Philharmonic Orchestra, along with the source music composed for the film as bonus tracks. The booklet contains liner notes written by noted author Randall D. Larson. This is a limited edition release of 1000 units.